Those towering trees in your yard can make your home cooler in the summer, give you privacy and provide a habitat for wonderful wildlife. But, the shade that they cast (along with that from nearby homes and outbuildings) can present a gardening challenge. Fortunately, though, many plants thrive in the shade—more than you may know. Although long-term color in a shade garden will come primarily from foliage rather than blooms, you may not know that your options for shade flowers reach beyond the ever-dependable impatiens. 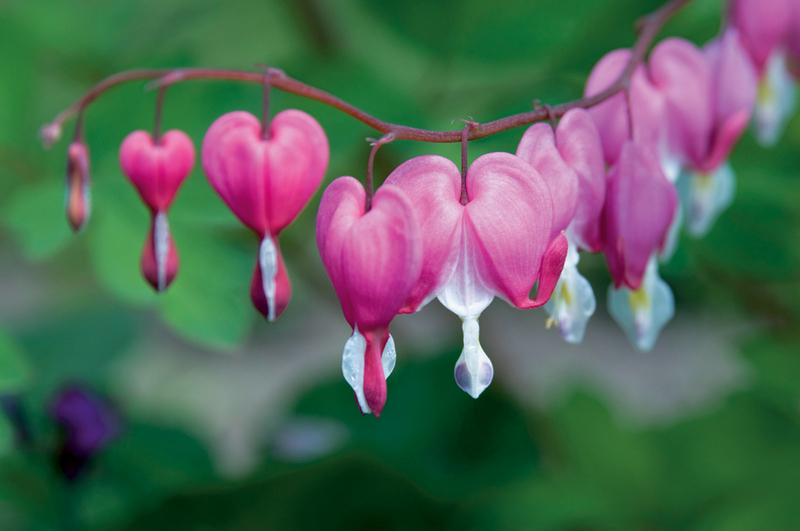 There are several varieties of shade-tolerating plants that have beautiful and colorful blooms. 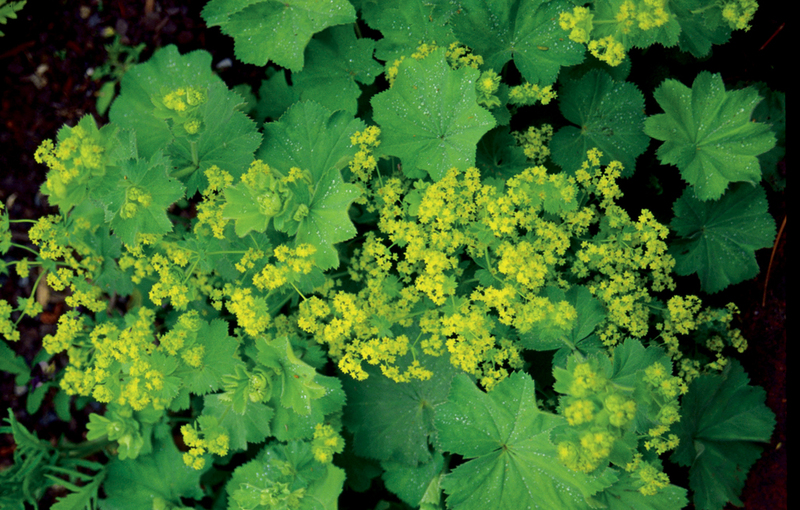 Many of those plants are groundcovers, including one of the ultimate design plants, Golden Creeping Jenny Aurea: a vigorous, quick-spreading plant with rounded bright-green leaves and golden-yellow blooms. This plant will do well on a shady porch or patio and is often seen cascading over the edges of a large planter. Another shade groundcover is Epimedium, found in many varieties and in different colors. The most common variety is Sulphureum, which produces a spiky yellow bloom. 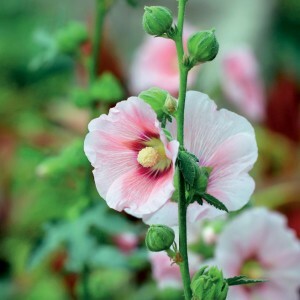 This variety is easy to grow and can be used to line a walkway or as a nice groundcover, swirling through a garden bed and accentuating other plants around it. Used as a groundcover or as a short plant at the front of a garden spot, Dwarf Goat’s Beard can add an interesting look to your space. This miniature version of the taller plant, usually seen along fence lines, grows about 1 foot tall and has leaves that closely resemble a fern, with delightful, feathery spikes of white blooms. One shade-loving plant with an exotic-looking bloom is the Japanese toad lily. Although you will have to wait for fall for the big show, it is worth the wait. The Japanese anemone blooms in the fall as well, so paired with its cultural counterpart, they can create quite a display. Popular types of anemone have white and pink blooms and can grow to be 3 to 4 feet tall, so they are best for the back of a garden bed and can also tolerate less-shady spots that may receive dappled sun filtered through the trees. Other shade perennials with blooms are Alchemilla, commonly known as “lady’s mantle,” which has a yellow bloom in the spring; varieties of hellebores, which bloom very early in the spring (pluck a few of these from the garden and float them in a shallow dish for a nice centerpiece); and pulmonaria, known for its white-dotted leaves and clusters of rosettes that change from blue to red, or from red to blue. When you think of color, though, sometimes the subtle hues of green, white or yellow are all you need to bring a shady garden space to life. 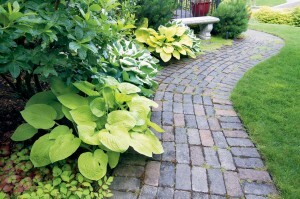 If you’ve tried your hand at shade gardening before, you no doubt started with hostas. Found at any garden center in enough varieties to make you have to think about the choice, the hosta is the most popular shade perennial, often called the “chairman of the shade border.” New varieties are being released each year, with the tally now close to 7,000. Known for their hardiness, hostas do well in virtually all areas of the country. Hostas can provide different leaf structures and growth patterns without having to call on blooms to play a starring role in the garden. With broad leaves and multiple shades of green, white and yellow (and in variegated colors), they can easily brighten up a dark spot in your yard. Nurseries are even experimenting with new colors. Blue hostas have leaves that are bluish in color, and some varieties even have red stems (and rumor has it that the race is on to cultivate one that has red leaves). The Hosta of the Year for 2014? The Abiqua Drinking Gourd. Its leaves are bluish-green and its blooms are white. The foliage is cupped, curving upward around the edges. Hostas are great complementary plants. Pair their broad leaves with frilly ferns and you have a tried and true shade garden combination. Try planting Blue Hostas near a Japanese painted fern (which is bluish and silver) for a nice combination. 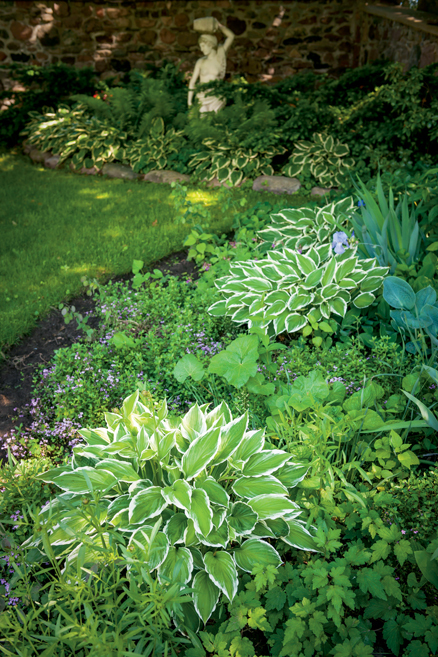 If you want varying sizes of plants in your garden, hostas can come to the rescue. There are many varieties of mini-hostas, which also are popular for window boxes. Grasses and Trees and Shrubbery…oh my! There are many plants that look like grass, but botanically aren’t, and they are perfect for shade gardens. Liriope, which you often see along walkways and driveways, can have solid green stalks or variegated colors. Purple shoots bloom from the center, making this plant look larger than life. Other “grasses” to try are sedges, Sweet Flag and Mondo Grass. With leaves that are thin and wave in the breeze, and available in various colors, they can animate your shade garden. They also do well in pots for shady porticos. 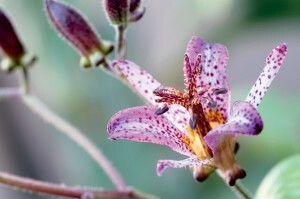 It may seem odd to add a tree to your shade garden, since you are trying to seek as much sun for your plants as possible, but consider that some understory trees, growing beneath the canopy of nearby taller hardwood trees, have beautiful blooms. Though you will have to exercise your patience as they grow to maturity over a few years, flowering trees are a great idea. 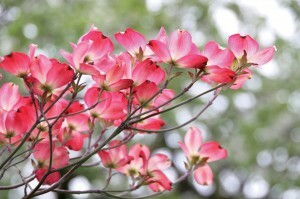 The most popular understory tree in Virginia is the dogwood, of course. It grows well at the edge of the woodland. It stays relatively small and can have pink or white blooms. 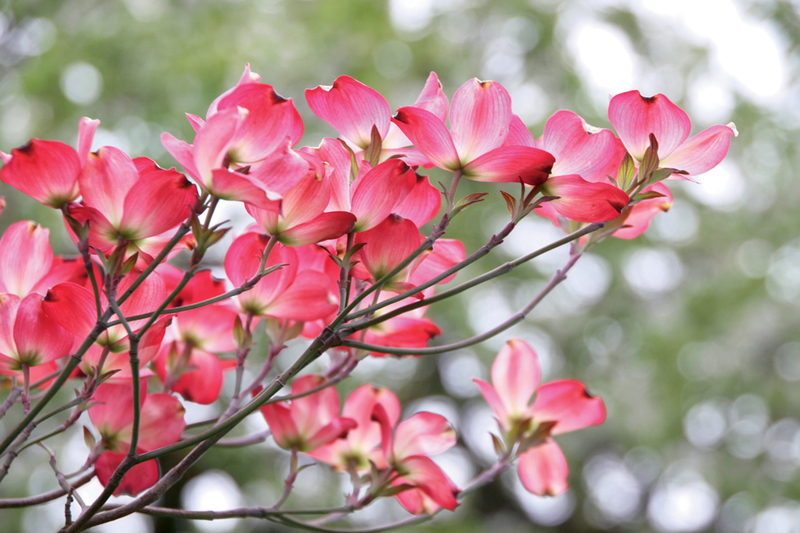 The Kousa dogwood is an Asian variety that is gaining in popularity for its ability to bloom later and resist disease better. Numerous white blooms can make the tree appear snow-covered. Japanese maples also do well at the edge of the woods and will give blazing fall color. Some shrubs can add variety and height to your shade garden. The camellia, with its beautiful large blooms, grows well along the side of a home and can grow to be tall. Azaleas, Virginia Sweetspire and Althea are all shrubs that don’t mind the shade and they can bring an abundance of color. If you’re going for big, look for the Aucuba. One variety of this hardy shrub has green leaves speckled in yellow that has become quite popular for nurseries. Maybe by now you have many different ideas in mind for the shady areas in your yard. Remember, it may take a couple of years to experiment with what works well in your yard as the amount of shade it receives varies with every season. But if you fail, try again. There’s no better reward for your hard work than taking a break in the shade on a hot summer day. 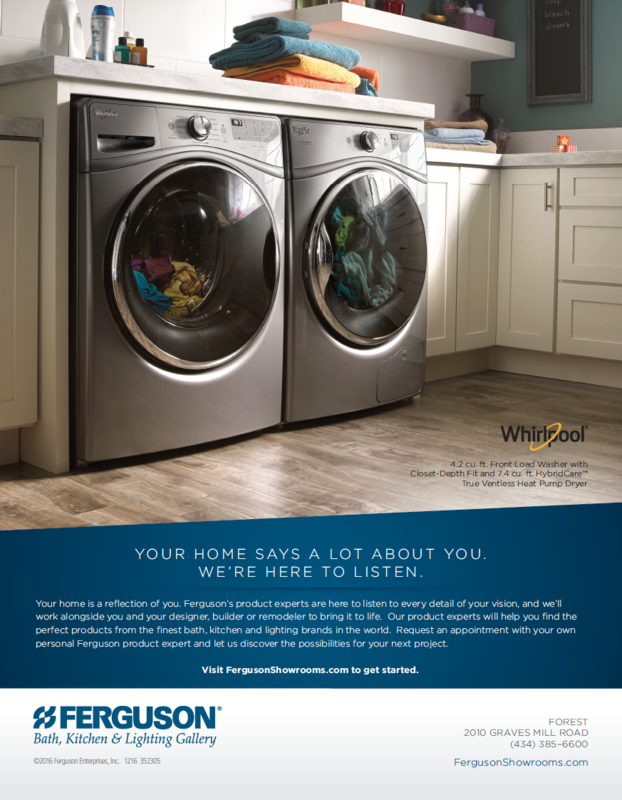 It will be your bright spot, for sure. HOME would like to thank Dr. Joe Pond, a Master Gardener with the Hill City Master Gardeners, for offering his expertise for this story. Pond has been experimenting with his own shade garden for 35 years and continues to give presentations on the subject to groups throughout the region. The Virginia Master Gardener program is part of the Virginia Cooperative Extension. Virginia is known for many plants that do well in the woodlands. Sometimes hard to cultivate, and thus harder to find, these native plants add splashes of beauty. Full shade: Place under a heavy tree canopy where it will receive less than three hours of sun. Part (or partial) shade: Place where there is no direct light (or if so, very brief in the morning), and no mid-day sun.